Let’s face it. Microflow LC-MS is a challenge. Only a few do it well, and even fewer do it well consistently. And for those who have had success, their methods can completely fall apart when being transferred to other analysts and labs. Without robustness and the ability to adopt into routine use, microflow LC-MS has remained a tool relegated to research applications. But scientists, by nature, are persistent. The benefits of microflow LC-MS – increased sensitivity, reduced sample and solvent consumption – are substantial, which led Waters to develop and launch the ionKey/MS™ System at Pittcon in 2014. Shortly after the system’s one year anniversary, Waters assembled a group of more than 30 key scientists and laboratory directors at the Frontiers in DMPK Meeting in Princeton, NJ, U.S., to discuss the system’s growing utility and projections for the future. Geoff Gearhart, Waters’ Senior Director of Core Research, opened the event by calling out the successes of the past year as the industry has embraced microscale chromatography and overcome the hurdles previously associated with its adoption. The series of presentations that followed provided multiple examples from industry and academia demonstrating that microflow LC-MS has moved beyond research, and is now being implemented across discovery and development for routine applications. The primary appeal of microflow LC-MS has been the significant boost in sensitivity it offers. In drug metabolism studies, a lower LLOQ affords a more complete picture, with a reduction in animal usage and more data from the animals being studied. The plug-and-play system has also enabled less experienced analysts to use the technology, with levels of standardization previously unattainable with microflow LC-MS. Cost savings are derived from all of the above, including reduced sample and solvent requirements, but one of the biggest impacts is the lower cost of ownership of the mass spec instrument over the long term, simply due to less liquid being injected. These benefits have been realized in core labs processing a wide range of small molecules and peptides from diverse matrices. Microflow LC-MS has afforded a middle ground for applications using nanoflow with its long run times as well as for discovery and regulated development laboratories where UPLC is standard practice. So where to now? Within Waters’ R&D, new column chemistries continue to be optimized, and applications have expanded from tandem quadrupole MS to high resolution MS (HRMS), specifically with Waters’ Xevo G2-XS Q-Tof™ System, which was launched at ASMS 2014. From the industry perspective, partnerships between pharma and CROs will influence adoption of ionKey/MS. Finally, a resounding message at the Frontiers in DMPK Meeting was that, with the growing need for ultrasensitive LC-MS methods, CROs that have implemented ionKey/MS will truly differentiate their companies from their competition. 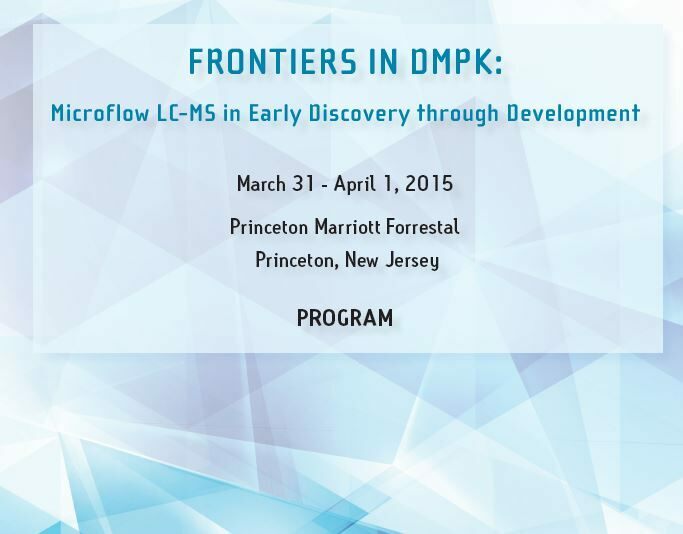 Join the conversation on Microflow LC-MS on LinkedIn. Click here to see a list of publications citing the use of the ionKey/MS. For a glimpse of Waters’ expertise in peptide and protein quantification, click here.